Infinity Canopy, Inc. Announces Issuance of U.S. Utility Patent Covering Its Revolutionary Shade System. The patented Infinity Canopy is the most dynamic and versatile shade system in the world offering Infinite Shade, Infinite Design and Infinite Possibilities. Its unique modular design allows it to adapt to any space, in one or multiple colors and offer unique features unmatched by any other shade system. The US Patent Office has issued the patent number 9,255,441 covering the unique and revolutionary features of Infinity Canopy that allow it to adapt to any space, be installed quickly, and changed even after installation. This is the first patent issued for Infinity Canopy with additional utility and design patents pending. Dr. Shargani the inventor of Infinity Canopy states, "We claimed to have revolutionized the canopy and this patent confirms that. This is a major achievement for our company, the shade products industry and the customers. We will continue the innovation and development of Infinity Canopy". Infinity Canopy is the most dynamic and versatile shade system in the world offering Infinite Shade, Infinite Design and Infinite Possibilities. Its unique modular design allows it to adapt to any space, in one or multiple colors and offer unique features unmatched by any other shade system. Infinity Canopy can be installed on pergolas or between two opposing structures on a pair of parallel cables. It can also attach directly to available overhead support indoors or outdoors. 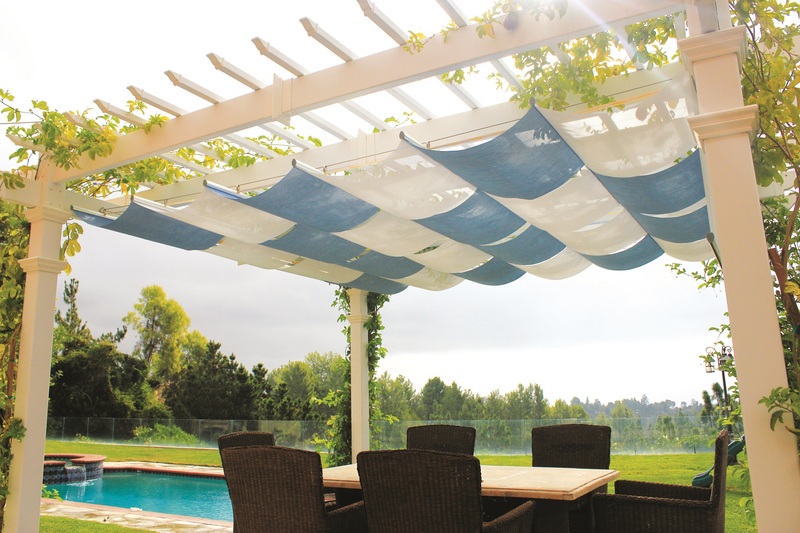 The canopy is comprised of individual shade panels that connect together to create shade sections in any length. Multiple shade sections in the desired length are placed side by side to cover any space. The individual shade panels can be in one or multiple colors and interchanged to create unique designs not possible by any other shade system. Canopies have become a common part of modern outdoor design for their simplicity, beauty, ability to cover long projections, and be retracted when desired. However, they have major drawbacks because they are made from one long piece of fabric and to fit properly they require precise measurements and fabrication. Once installed these canopies can’t be modified and repairs (if possible) require an expensive trip back to the shop. “I encountered these draw backs first hand when I wanted a canopy for my house. I felt the current canopies were inadequate and antiquated which led me to develop Infinity Canopy.” says Dr. Shargani inventor of Infinity Canopy. In contrast Infinity Canopy’s is modular. 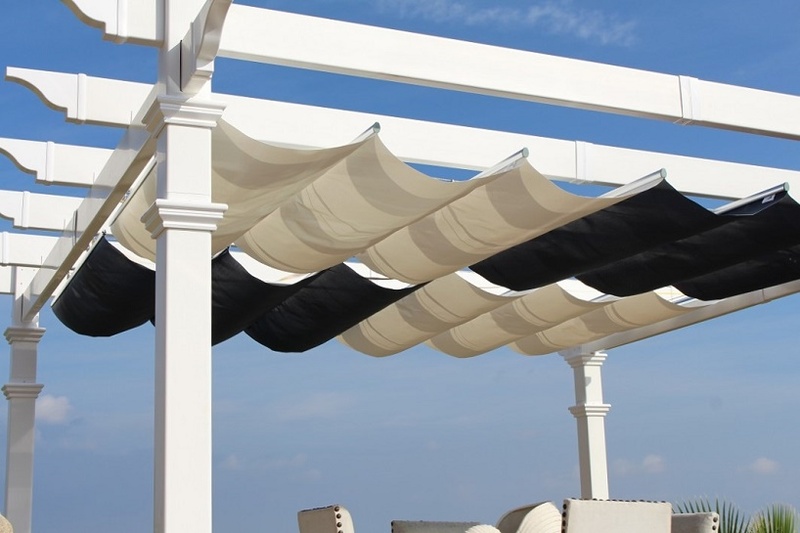 It uses individual shade panels that are connected together one at a time to create a canopy that can be as long and wide as needed to adapt to any space. The individual panels can be in one or multiple colors to create a simple or multi-color canopy. Every aspect of Infinity Canopy can be changed even after installation to create infinite configurations and designs not possible by any other shade system. Repairs can be completed on site using readily available parts and panels.